What Is Carburation? What Are the Factors Affecting Carburation? What is meant by carburation? Carburation is defined as the process of mixing of combustible fuel with the proper amount of air before it enters the engine cylinder. The purpose carburation is to provide an air-fuel mixture in required quantity and quality for the efficient operation of engine. The correct air-fuel ratio is important in performance of spark ignition engine under various condition. The process of carburation not required in compression ignition engine because in CI engine, fuel directly injected into the compressed air in the cylinder at the end of compression stroke. The device which mix air and fuel in the required ratio is known as a carburetor. What are the factors affecting carburetion? Modern engine run at a very high speed that reduces the time for carburation. For example, the engine running at 3000 rpm get approximately only 10 millisecond for the carburation. In this scenario in order to get high-quality air-fuel mixture, the velocity air should be increased. This high velocity is achieved by introducing a venturi section in the path of air. Temperature and pressure play a major role in producing a homogeneous air-fuel mixture. High air temperature increases the vaporization of the fuel. Temperature can be increased by heating the intake manifold but the higher temperature of input air decreases output power and volumetric efficiency. The presence of highly volatile hydrocarbons in the fuel plays a big role in good quality carburation, especially at high engine speed. Fuels that vaporize easily at normal temperature give good carburation. 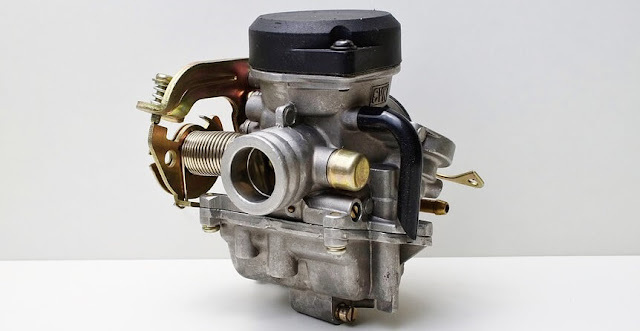 There are different types of carburetor based on the design. Carburetor must be designed for quality carburation at various operating conditions (idling condition to maximum power requirement).